PALO ALTO, Calif.–(BUSINESS WIRE)–Fanplayr, the leader in solutions for targeted e-commerce offers, today announced global expansion that will support the company’s Smart & Targeted Conversions platform for e-commerce merchants. The company’s sales and development team now includes partners in Japan and Italy. Fanplayr’s Smart & Targeted Conversions is a breakthrough approach to boosting online sales. The company will be exhibiting and demonstrating the product (Booth 649) at the Internet Retailer Conference & Exhibition (IRCE) in Chicago from June 4 through 7, 2013. Fanplayr’s products improve interaction between merchants and their customers, which is valuable in the Japanese market. It digitally incentivizes and builds relationships in a way that is manageable and measurable. By delivering dynamic, targeted, on-site offers in real-time, Smart & Targeted Conversions analyzes visitor behavior, segments traffic and presents targeted offers to online consumers. Replacing today’s common “spray and pray” coupon approach, e-tailers can take control of their offer campaigns, measure the effectiveness, and make adjustments in real-time, helping close sales while using the minimum discount needed to convert a prospects into customers. Fanplayr’s Smart & Targeted Conversions is an intelligence-based offers platform designed to help online merchants increase sales, improve average order values and optimize purchase incentive margins. Purchase incentives can have a profound impact on revenue and margins. The right offer at the right time can help merchants close a sale, while using the minimum discount needed to convert a prospect to a sale contributes directly to bottom line. Smart & Targeted Conversions first analyzes a merchant’s site and visitor behavior to determine profiles of visitors that would be most receptive to specific offers and timing. Its SaaS-based platform is then used to create real-time campaigns that segment traffic and present dynamic offers based on visitor behavior, providing the right offer at the right time for a lift in conversions. 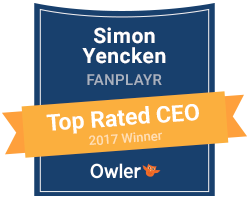 Fanplayr’s customers have seen an increase in conversion rates as high as 25 percent and average order value up as much as 50 percent by using Smart & Targeted Conversions.